Today, the Norfolk Commemorative Silver Half Dollar Coin tells the story of the oldest civic mace on its 261st anniversary. It was buried—twice—to protect it against enemy soldiers, found amid litter at a police station and, in a final indignity, put together incorrectly and displayed that way for years. Yet, the city’s ceremonial silver mace has survived intact for 250 years, an elaborate piece of art with ties to many parts of America’s history. Robert Dinwiddie, the British acting royal governor of Virginia, gave the mace to Norfolk on April 1, 1754, as a token of his regard. The scepter, a symbol of royal authority, is nearly 3 1/2 feet long and topped with a crown. Maces were used as weapons in medieval times and later evolved into ceremonial royal objects. While more than 500 maces are still in use in Great Britain, the Norfolk mace is believed to be the only city mace left in the United States kept by the city for which it was commissioned, said Gary Baker of the Chrysler Museum of Art, which displays the mace. Williamsburg had a mace when it was Virginia’s Colonial capital, but the mace’s top was lopped off and turned into a drinking vessel, said Baker; the museum’s curator of glass, decorative arts and historic houses. South Carolina has a state mace. Crafted by British silversmith Fuller White, the Norfolk mace is full of royal imagery, including a shield with the arms of Great Britain and emblems of the lands claimed by the British monarchs: a rose for England, a thistle for Scotland, a harp for Ireland and a fleur-de-lis for France. 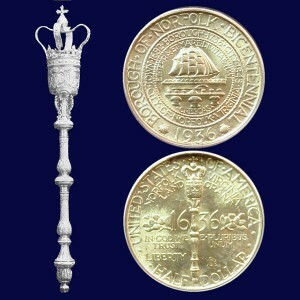 The crown of St. Edward, used in British coronation ceremonies, is represented at the top of the mace. The year Dinwiddie gave Norfolk the mace, he started George Washington’s military career by sending him to the Ohio Valley to enforce Great Britain’s claim to the territory. Dinwiddie’s efforts to drive the French out of the valley led to the French and Indian War. Before the Revolutionary War, the mace was carried ahead of the Norfolk mayor in processions and upon entering the court. In January 1776, the British attacked the seaport city, burning buildings near shore. Revolutionary forces burned more buildings to deny the British quarters and the city was destroyed. The mace survived because city officials had the foresight to bury it on a farm. The next recorded appearance of the mace was on July 4, 1788. It was carried in a parade celebrating America’s independence and Virginia’s ratification of the Constitution. The mace was buried again during the Civil War, this time because the Yankees were coming. Mayor William Lamb hid it beneath the hearth of the fireplace in the third floor library of his home, which ended up being occupied by Union troops. In 1881, the mace was placed in a bank. It disappeared when the bank closed four years later. The police chief found it among clutter in a storage room at police headquarters in 1894, McPhillips said. How it ended up there isn’t known. The mace was restored and placed in another bank. It was transferred to the museum in 1989. Along the way, the mace also survived proposals to make it less kingly by stripping it of its royal symbols. The city plans to commemorate the 250th anniversary of the mace’s presentation in a variety of ways this year, including school programs and a display at City Hall, which has a replica of the mace. Meanwhile, the museum has spiffed up its mace exhibit. What Baker calls the “leisure-suit blue” background of the display case has been replaced with a darker blue that better sets off the mace. It is flanked by period British and American flags, and portraits of Dinwiddie and Washington hand nearby. As Baker began working on the revamped display, his knowledge of heraldry made him suspect the crown atop the mace wasn’t properly aligned with the coat of arms. Checks of reference books on heraldry and 18th-century English architecture confirmed that and also made Baker realize that the curves on the staff weren’t symmetrical but should have been. The mace is made of nine to 11 interlocking sections. A wood shaft, actually a broom handle, runs along the length of the staff. At some point years ago, someone took the mace apart and inadvertently screwed pieces back together in the wrong order, said Baker, who saw to it that the mace was reassembled correctly. “Some of our British visitors [to the museum] must have thought, ‘Those stupid Americans,’ ” Baker said with a shake of the head. The Norfolk Commemorative Silver Half Dollar Coin shows beside a circa 1909 view of the incorrectly put together Norfolk mace.